Synopsis: For a woman with a charmed life, Giselle Koy's path of the modern spiritual seeker was tricky. Based on the ancient master/disciple paradigm, she set out to find a living master. After years of searching, Giselle was invited into the Buddha Field, an exclusive underground mystery school led by a charismatic South American spiritual master. His attractive devotees became intoxicated with love and truth. Giselle's complex inner world went to battle with the master's core teaching: "Through total surrender comes total freedom." For years, she was immersed in this all-encompassing secret "ashram without walls" where virtually every day was intensely filled with group meditations and classes, explosive personal confessions and glamorous gatherings. What Giselle didn't expect was how thoroughly the master would deconstruct her ego, transform her personality and even give her a new name. 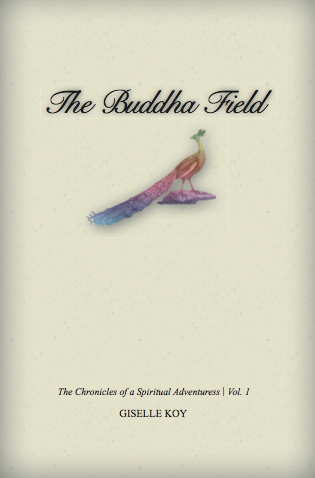 Her life bloomed into her own private 60s-style revolution within, The Buddha Field. But when a sexual scandal erupted, Giselle had to choose between continuing her devotion to her master or finding the guru within. Giselle Koy is a professional muse, intuitive creative coach, author, speaker and radio show host. She counsels entrepreneurs, artists, CEOs and anyone interested in attaining a purpose-filled and joyful existence. Her popular "Sparkling Intersections" radio show on BlogTalkRadio features interviews with today's thought leaders in spirituality, healing and the arts. Giselle is the author ofThe Modern Muse: How to Create the Ravishing Life You've Always Wanted.